Graz is a not a “love at first sight” city. Instead, it slowly gets under your skin, and by discovering its squares and forums, it keeps bringing you back until you start to understand the hidden language of Austria’s second largest city. Graz became the European Capital of culture 13 years ago, and since then much has changed. The legacy of the brilliantly executed event can be seen and felt at every step. It seems Graz gained a big dose of confidence by hosting the event, which can be seen most of all on the monumental Schlossberg. 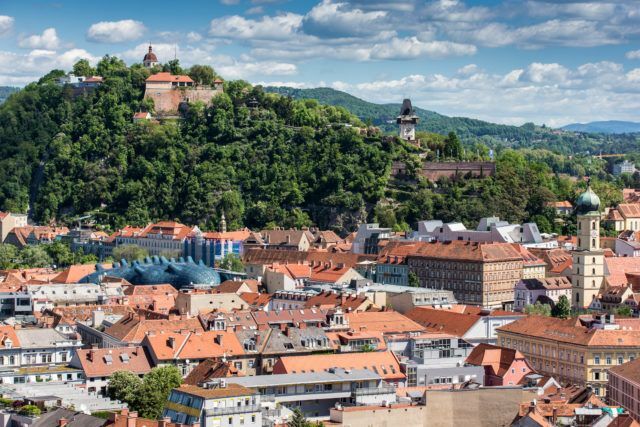 If you ask the locals, they will explain that the Schlossberg is symbolically the heart of the city, surrounded by new iconic buildings, amongst which the unearthly architecture of the Kunsthaus Graz stands out. It was designed by British architects Peter Cook and Colin Fournier, and with every visit their brilliance shows itself to the visitor. The Alien, as the locals name it, is above all an interesting special venue. Graz is considered by many as a small city, but urban enough to have one of the most exceptional congress infrastructures in the region. A big part of the new infrastructure was made due to the European Capital of Culture when the city was invigorated along with the entire infrastructure. The Stadthalle Graz, opened in 2002, belongs to the most modern event spaces offering the most spacious hall in this part of Europe. They have managed to create synergy between concerts, congresses, TV shows, fairs and sports events. The hall has become an example of functionality and aesthetics. Over 700 diverse events hosted every year speak of the success of the concept. Nevertheless, we cannot overlook halls such as the Helmut List Halle, which is a perfect example of the transition from a factory to an exhibition and congress centre, and many special venues as well. You can find something interestingly similar when first glancing at closed doors, behind which courtyards hide, offering a great alternative to classic venues. The 15th symposium on energy innovation. Congress of the German Network for Evidence-based Medicine (DNEbM). The Network and congress is the German-language competence and reference centre for all aspects of evidence-based medicine. The audience is truly interdisciplinary with a mix of EMTs, nurses, students and physicians, most of them involved in prehospital emergency medicine. What started in 2014 as a contemporary marketing conference has since then grown into an interdisciplinary business festival gathering thinkers, makers, and leaders from all around the world. Europe’s largest conference in the field of sensors, actuators, micro- & nanosystems, as well as related materials and fabrication technologies. They are also proud of their local organic products, sold every day on the market by local farmers. Every year in August, depending on weather, the mega table for 700 guests is set in the old town centre, where wine and local specialties are served. They also organise degustations of the products of local breweries and winemakers. Especially outstanding is the young generation of winemakers that by producing light, dry wine varieties belong to the very top of Austrian wine-making. City Challenge Graz: Resolving original team-building tasks across the inner city of Graz, whilst experiencing the city’s highlights with a great fun factor. During the challenge, teams are looked after and entertained by our professional experience builders. The answer regarding the most typical gift from Graz is unanimous. The Steiermark pumpkin seed oil, recognised for its exceptional taste and quality, labelled with a special control number can be a great gift or memory of the flavours of Steiermark. Graz has a rich industrial history, and it’s nice to see how abandoned spaces get a new purpose. The most famous such venue in Graz is Seifenfabrik, an architecturally protected building, managed by the private company Kovac Management, where from 1872 to 1997 soap was produced. The owner decided that the best new function for the building should be hosting events and since 2002 it has become a highly desired special venue in Graz. The space along with the industrial charm is appreciated mostly by companies. It is also suitable for gala dinners and classic congresses. The Steiermark capital proudly holds the title of UNESCO City of Design. The first and easiest way to uncover this is when choosing the hotel. For starters, we recommend visiting the Wiesler Hotel. Each room in this fabulous designer hotel tells a different story. The classic hotel from 1909 is today a perfect example of a new generation modern hotel, where you are surprised by creativity in design, furniture and gastronomy at every step. Creativity connects it with cities such as Melbourne, Berlin, Östersund, Nagoya, Seville, Lyon, Shenzhen, joined together into the Creative Cities Network project. Cities in the network have a significant cultural heritage and a healthy and diversified present creative scene. We are sure that this project can be an added value for your event and participants. The fantastic projects, many events, and more than 40 hotspots are the reason why you should visit Graz again. Graz has become a perfect example of using significant events for all-around development. This is most seen in tourism, as over a million tourists visit the city every year. The relaxed central European rhythm attracts many meeting planners as Graz offers excellent congress infrastructure. Based on the data from the Graz Convention Bureau the percentage of room nights by congress participants is 14%. This is because of the well-developed network of scientific institutions, connected by Graz’s mayor Siegfried Nagel. Every year the most deserving professors are awarded the Graz Congress Awards. A part of the story is also the incredibly transparent Conference Subsidies in the case of creating over 300 night stays with a congress. Development doesn’t seem to have an end in this field, and a big part of this is unquestionably because of the Graz Convention Bureau, still among the best congress bureaus in the region. There is rarely any city of this size covering such a small area with so much to offer and topped off by the kindness and easiness of locals giving Graz an almost Mediterranean feel.